No longer fumble to activate garage door opener! Do not interfere with existing remotes or wall system. 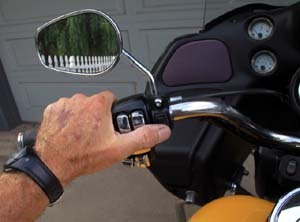 The Switch housing connects to the sender unit via blade connectors and Sender unit attaches anywhere on the front of the motorcycle with (pre attached) double sided velcro. Sender unit includes a 12v long life alkaline battery (easily replaced). Receiver unit plugs into any 120v outlet in your garage. 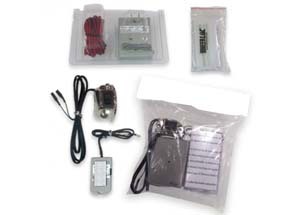 Use included 20 ft of wire to connect to wall mounted door control or garage door opener itself. The kit also includes a set of our proprietary SHEERLOC® invisible wire fastener’s for an alternative to unsightly zip ties. RD-BTMGR: Garage door using Domed Push Button Mom/ON/OFF. Push button can be mounted anywhere on any vehicle! Not just for cycles... cars, trucks, RVs. RD-GP1: This is the complete garage door kit for a Harley-Davidson™. Designed to work with almost any type of garage door. RD-TS1: Push Button Garage door + Momentary On/Off. This is the complete garage door kit for a Harley-Davidson™. Designed to work with almost any type of garage door. RD-TS2: Push Button Garage door + On/Off toggle. This is the complete garage door kit for a Harley-Davidson™. Designed to work with almost any type of garage door. RD-TS3: Push Button Garage door + On/Off /On toggle. This is the complete garage door kit for a Harley-Davidson™. Designed to work with almost any type of garage door. RD-TS2L: Push Button Garage door + On/Off Lighted toggle. Your choice, Amber or Blue Lighted Toggle Switch. This is the complete garage door kit for a Harley-Davidson™. Designed to work with almost any type of garage door. RD-TS4AR: Push Button Garage door + On/Off/On Mometary Toggle. Divided power outs (air rides etc.) This is the complete garage door kit for a Harley-Davidson™. Designed to work with almost any type of garage door. RD-GPGRX2: On/Off/On Dual Rocker, with 2 garage door openers. This is the complete garage door kit for a Harley-Davidson™. Designed to work with almost any type of garage door. RD-TS4: Push Button Garage Door + On/Off/On Mometary toggle, Reverse Polarity ( motor drives etc.) This is the complete garage door kit for a Harley-Davidson™. Designed to work with almost any type of garage door. RD-TS1GR: Push Button Garage Door + Garage Door toggle. This is the complete garage door kit for a Harley-Davidson™. Designed to work with almost any type of garage door. RD-TSGRX2J: Push Button(M) +Dual rocker, 2 garage door openers. This is the complete garage door kit for a Harley-Davidson™. Designed to work with almost any type of garage door. since 1982. Easy do-it-yourself instructions included. Can be installed in less than 15 minutes with standard household tools. 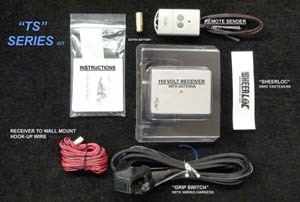 F2P-102: This is the complete set that consists of the patented transmitter, corresponding receiver, all installation hardware and easy do-it-yourself installation instructions specifically packaged for motorcycles. F2P-T: Additional transmitters can be added to existing Flash2Pass™ Systems. A total of six transmitters can be added to one receiver. F2P-R: Additional receivers are available for second/vacation homes. This allows the same transmitter that activates the primary garage door opener, to activate a second garage door opener. The number of receivers a transmitter can be programmed into is unlimited. F2P-AC: Approximately 4-5% of garage door opener motors do not produce enough power to energize the F2P-102 receiver. This adapter plugs into a hole located on the bottom right side of the receiver and a standard wall outlet. 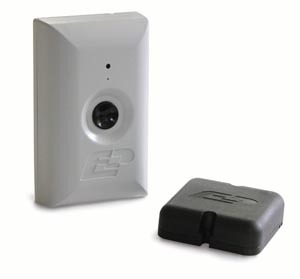 T2P-350: The Tap2Pass™ receiver, along with the free Tap2Pass™ app, is designed to turn your iPhone, iPod Touch or Android powered phone into a remote for your automatic garage door or gate opener. Utilizing the Bluetooth capability of the iOS or Android platform we created a keypad entry right on the screen. Simply tap in your 4 digit PIN and the door or gate is activated. Bluetooth technology was chosen as internet access is not required for accessing remote gates or doors, and as a safety feature, since the garage door or gate should always be in sight when activation occurs. The four digit PIN makes entry quick and easy as well as safe as it is an extra layer of security in the event the device is lost or stolen. 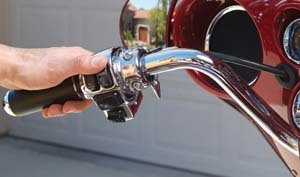 The Tap2Pass™ receiver can pair with as many as 7 Smartphones, and up to 24 vehicles (cars, motorcycles etc.) 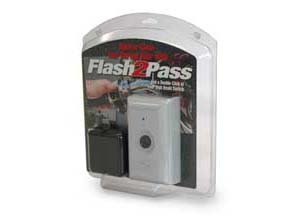 equipped with a Flash2Pass™ transmitter (available for purchase separately). 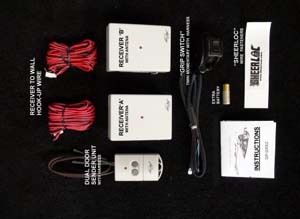 The receiver will work with virtually all garage door and gate openers manufactured since 1982 including AC, DC or solar powered (solar powered gate: power kit available separately), and newer models with “smart panels”. Installation is an easy do-it-yourself project and shouldn’t take more than 15 minutes using just a screwdriver. 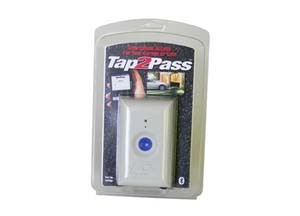 Full instructions are included with the Tap2Pass™ receiver.